EBU conducts UHD High Frame Rate Tests at European Championships 2018 featuring five Members and 19 technology partners including Solid State Logic. 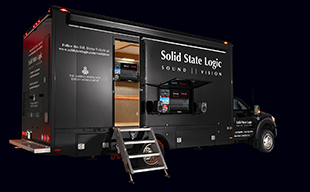 The trials will take advantage of the new immersive audio architecture that is now part of SSL's System T broadcast audio production environment. The 1080p100 programme will also include Next Generation Audio (NGA) sound in the form of 4+7+0 channel and scene-based beds, with four additional interactive mono object signals for two commentaries and two audio descriptions. These trials would not be possible without the help and the support of several technology providers, in particular (in alphabetical order): ATEME encoding and remuxing technologies for the 1080p100 feed with all NGA flavours; Dolby immersive and object-based audio technology (AC4); Ericsson contribution technology (HEVC, MPEG-H Audio) for 2160p50; EVS server for near real-time 2160p100 editing; Fraunhofer IIS immersive and object-based audio technology (MPEG-H Audio); Jünger Audio 3D audio monitoring and authoring units (MPEG-H Audio); KaiMedia encoding technology (HEVC, MPEG-H Audio) for 2160p50; Klang and Areitec 3D audio monitoring over headphones; LG prototype OLED TV sets capable of decoding the live UHD streams with HFR (2160p100Hz), HDR (HLG & PQ), and NGA (Dolby AC-4); NTT encoding technology for the 2160p100 signal; bcom scene-based production tools and Qualcomm compression technology (MPEG-H Audio); Rohde & Schwarz servers for uncompressed recording; Schoeps and Areitec ORTF-3D microphone outdoor set; Sony XVS video switcher, PWS Live production server and storage solutions configured for a 2160p100 video production workflow and HDR acquisitions, plus one complete Sony UHD camera and 2160p50 picture monitoring; Solid State Logic System T S300-32 mixing console with 3D panning and Network I/O; TPC, the Swiss broadcaster’s operational subsidiary, will supply two other complete cameras, and a fourth camera will be provided by AMP Visual. SSL’s immersive audio implementation for System T places support of Next Gen Audio for ATSC 3.0, Dolby Atmos, and MPEG-H at the heart of the console architecture. With the emergence of 3D Immersive Audio in broadcast as well as in film, SSL’s new 3-axis co-ordinate panning for System T incorporates 2- or 4-channel overhead speakers into the available channel and bus formats. As well as positioning mono and stereo sources in a 3D sound field, System T can accept multichannel 3D sources and fine tune their spatial components as they are added to the final production mix. This is essential in multilingual sports productions where effects and ambience multichannel 3D ‘beds’ will be used extensively as the basis of the individual program mixes. Other Immersive additions include intelligent downmixing facilities, a 3D monitoring section with 49 12-channel inputs, and an extensive set of processing tools for the new wide architecture.